That phrase has been uttered often throughout the Commonwealth this year, especially by Drew Franklin. While some may chalk it up to haters hating, it’s objectively true in a few statistical categories. 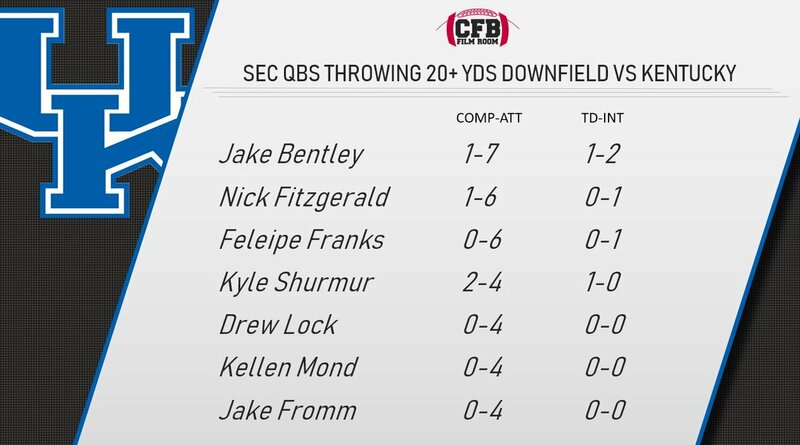 Tennessee’s offense is bad. The Vols are ranked dead last in the SEC in three of the four major offensive statistical categories. The most remarkable feature of the Tennessee offense is their inability to run the football. Last week against Charlotte they only rushed for 20 yards. Over the last five games, Tennessee has surpassed the 100-yard mark on the ground only once. Now they’ll go up against a UK defense that was ranked in the top 25 in rush defense until D’Andre Swift and Elijah Holyfield came to town. Tennessee relies on Jarrett Guarantano’s big arm to move the ball down the field, and they’re not too bad at it. Ranked sixth in the SEC in pass plays over 20 yards, they had at least our in a win at Auburn. Here’s where the Vols will hit a road block against Kentucky. Defensively, Jeremy Pruitt has gotten a lot of his unit, but it’s still nothing to brag about. The numbers don’t jump off the page. The Vols employ a similar scheme to what UK saw last week, without the caliber of athletes that Georgia brought to Kroger Field. Compared to previous opponents, Tennessee might have the worst FBS defense Kentucky has seen. It’s the perfect recipe for Eddie Gran to get the offense back on track. Tennessee is not a great football team. They’re fighting for a bowl berth. If Kentucky lands the first punch, the fight could end early at Neyland Stadium this Saturday. Kentucky just made bad decisions last week and our best tackler and blocker got booted from the game. It wasn’t until he got ejected that those big runs started happening. And our offense didn’t look bad it looked lost one play, frustrated the next, they had chances against a good opponent they just missed them. Tennessee should give them more opportunities and less points to deal with. If Kentucky can settle down I see a nice bounce back win where UT gets to be the brunt of a lot of pent up aggression. Not saying a blowout but not close. I truly believe the way they started playing late they pulled their head out of their butts because they could/should have lost by 30. You’ll be worshipping Wilson after next week, Nick. He’ll look really good against this trash Tenn team. Gran will make the TN defense look like the ‘Steel Curtain’. But hey, our defense is awesome! Hilarious! Still rolling on the floor!